Our smart phone app will put vital greenways information directly into your hands. It will include way-finding and directions, destinations, amenities, and opportunities for feedback. Thanks to a generous donation from GiveCamp Memphis (www.givecampmemphis.com), we have built two beautiful, functioning mobile apps for iPhone and Android! We are still working to bring these apps to the App Store and Google Play Store, and when this is complete we hope to have a Launch Party to supplement these funds raised on ioby. To continue to offer the apps and keep the data current and accurate, we will need to establish a maintanenance fund. We hope that through your donations on ioby, we can raise $3,000 annually for this purpose. Mapping our regional parks, trails, and greenways as they expand and connect is a top priority of the Mid South Greenways Steering Committee and its member organizations. The most current data is available on a variety of websites, and while this is a victory, accessibility limitations continue to be a barrier for many Mid-South residents. Therefore, we ask: How can we put these maps into the hands of Mid-Southerners when they are outdoors without access to a computer? If we were able to reach them, we could encourage them to extend their trip; help them discover new and exciting parks, trails, and destinations; and even improve their outdoors experience by providing seamless navigation. Mid South Greenways leaders put their heads together with Hieroglyph Creative Co. and devised a solution: a way-finding smart phone application. With your support today, an investment in the development of the smart phone application means that the app will be free for all residents to download. Memphis and the Mid-South region is of the verge of becoming a leader in the bike/pedestrian movement, earning Bicycling magazine's "America's Most Improved Bike City" in 2013. Other peer cities have turned to smart phone application technology for way-finding and discovery (RGreenway in Raleigh, Ride the City in NYC) – with your help today, we can secure a spot among these leaders and provide an invaluable service to Mid-South residents in a cost-effective and practical way. All of the most recent mapping data has been acquired as part of the Mid-South Regional Greenprint and Sustainability Plan, and the creators of the RGreenway app in Raleigh, NC have agreed to donate code to help smooth the initial development process. The code and mapping data will be transferred to Hieroglyph Creative Co for final conversion into the design of the app. Based upon conversations with Hieroglyph, we estimate that the app will take a total three months to perfect. With the publication of the online Mid South Greenways User Friendly map (www.midsouthgreenways.org/map), Mid South Greenways digitally mapped the location of our growing number of parks and trails the region for users of desktop computers. The map helps those interested in getting outdoors with the planning of their greenways trips, and it empasizes importance of a regional system by demonstrating the benefits of larger scale connectivity. However, with its launch in 2011, we immediately recognized its limitations, and we brainstormed ways to take this tool to the next level. We wondered: How could we provide this information to greenways users when they are outdoors without access to a computer? Way-finding signage is sparse in our region and can be very expensive to erect. A smart phone application that is free for download and allows users out on the trails to make connections between local assets is a more cost-effective option. For example, anecdotal information tells us that several people once they reach the end of the Shelby Farms Greenline simply turn around. With this App, now cyclists and pedestrians can pull out their smart phone and access information regarding the parks, trails, and destinations that are closest to them. This will include routes and distances to travel safely compelling to user to continue his experience. Users will become more familiar with existing green infrastructure and will also be able to determine where the missing connections should be made. With the knowledge in their pockets of where these existing facilities are, they will be more likely to frequent them. We do not foresee that this smart phone application will be used solely for recreational purposes. We anticipate that commuters and those who wish to engage in active transportation, thus lessening the impact of transportation on the environment, will also utilize the smart phone application to find safe and efficient routes. To ensure active transportation is a feasible option, it is important to display nearby amenities. Our User-Friendly map began the groundwork for this with trail profiles, and we will continue to interpret this data by including a layer with nearby amenities, such as available restrooms, water, bike racks, and bike shops for repairs. This will create extra value for the smart phone application from those users who are out on the trails and in our parks either for recreation or for transportation. Current statistics indicate that there is a significant market for this smart phone application in the Mid-South. Regional studies have determined that local smart phone ownership is higher than the national average and is on the rise. Based on a 2012 Obsidian PR and Research Dynamics poll, 66% of Shelby County residents own a smart phone, up 6% from the previous year, and surpassing the Pew research Center’s national ownership rate of 56%. Memphis and the Mid-South is of the verge of becoming a leader in the bike/ped and active transportation movement earning Bicycling magazine's "America's Most Improved Bike City" in 2013. Other important bike and pedestrian leading cities are turning to smart phone application technology. For example, Ride the City is a very popular smart phone application in New York City that uses GIS maps to help cyclists navigate the city streets with options for a more direct route or safer route. A better example, is Raleigh, North Carolina's RGreenway app. In the year since its launch, 14,000 people have enjoyed its maps and connections; they have been prompted to check-in, boosting exposure of greenways; and they are assisting with the maintenance of trails by easily sending in reports on vandalism or condition issues with the SeeClickFix feature. 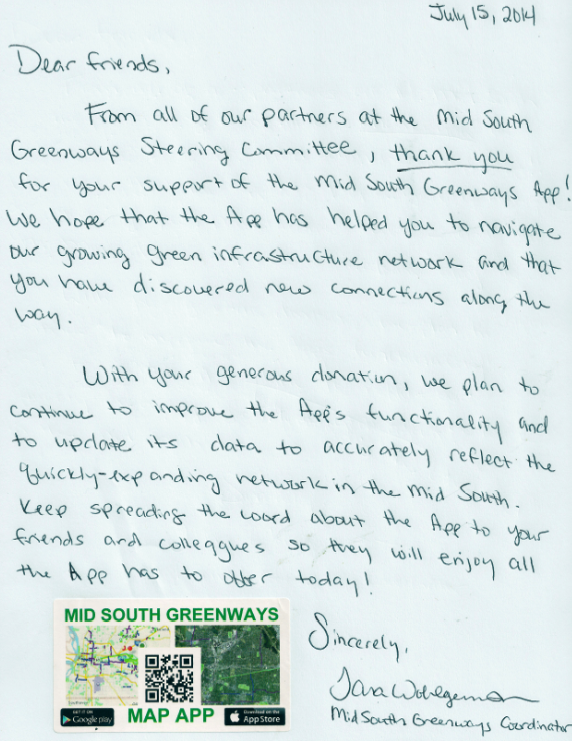 The Mid-South and its greening organizations are eager to stay ahead of the curve and offer way-finding information in the most cutting edge, cost-efficient, and practical way possible: with the launch of the My Greenway App. Thanks to a generous donation from GiveCamp Memphis (www.givecampmemphis.org), both iPhone and Android versions of the app are ready to launch! We are so appreciative of the assistance GiveCamp has provided, and we want to ecstatically thank the star developers who helped to make this a reality: Daniel Lissner, Forrest Williams, Ben Deming, James Giles IV, Harrison Witt, and James Kegel. However, “what happens at GiveCamp, stays at GiveCamp,” and if we are to make these apps a true success, we will need funds to update the mapping data annually. So, we still need your support!! Please consider making a donation today to the annual maintenance fund for these apps so that we can continue to provide clear and accurate data in the palm of your hand – whether that device in your hand is an iPhone or an Android! If you have knowledge of GIS or mobile app development, we would love to have your expertise to continually maintain the app and its mapping information!